Happy Monday friends! 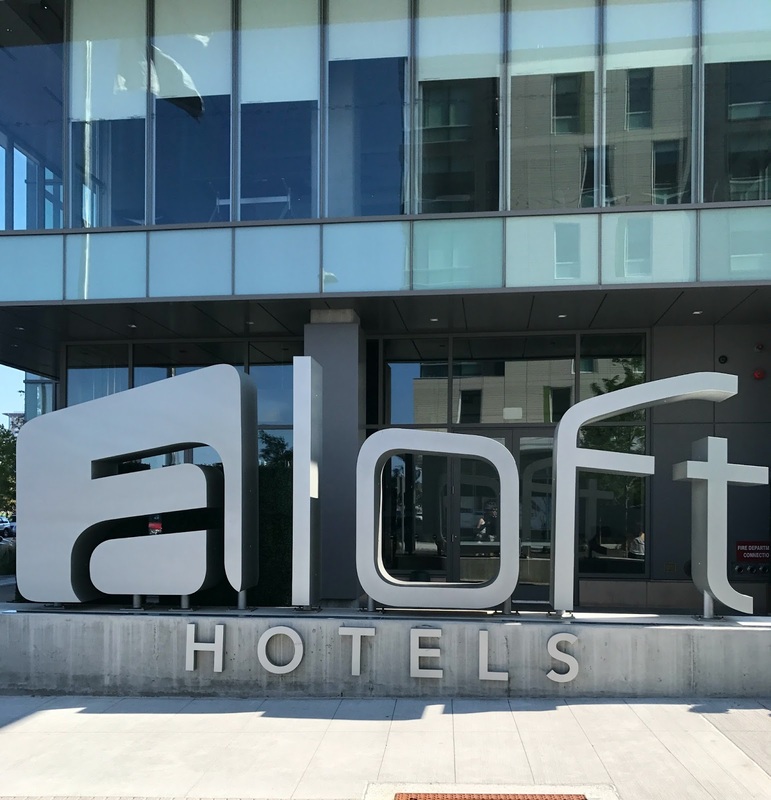 For the last few years Gary & I have wanted to do a staycation in Boston and this weekend we checked that off the list with our stay at Aloft Boston Seaport! 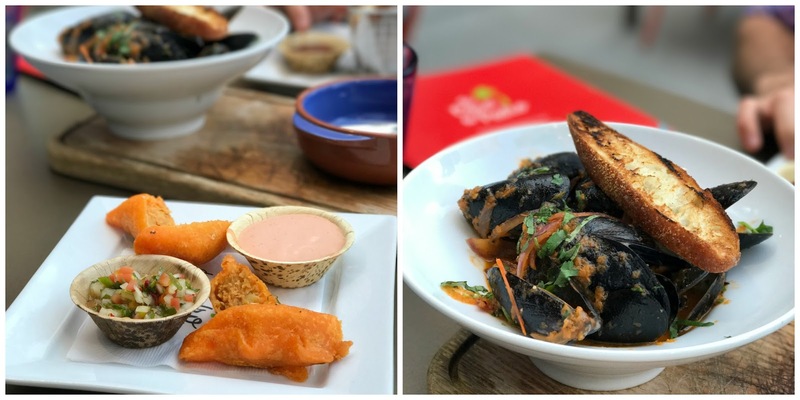 We challenged ourselves to eat at new restaurants and check out new parts of the city that we don't normally get to visit, which really did make the entire weekend feel like a little vacation! Get ready, photo overload ahead! Walking into Aloft you are instantly greeted with the bright and modern ambience of the main floor! 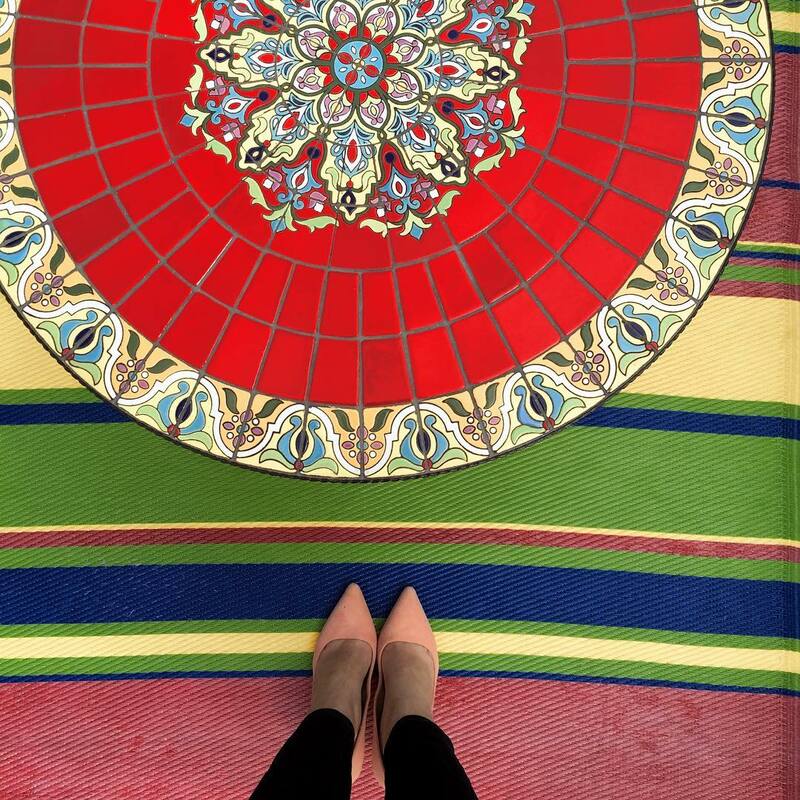 From the colorful art installations to the cheerful front desk employees - everything just feels happy! I read up on some of the fun features of the hotel & the one we (read Gary) was really excited to try out was SPG Keyless - you can open your room with your phone or apple watch if you have the SPG app (Starwood Preferred Guest), while I was most excited for the free Wifi both in your room and around the property! Another fun modern touch were the touch screen elevators - there are actually no buttons in the elevator itself and it flashes with which elevator to walk into. Our room overlooked the Lawn on D & downtown Boston! While we love all city views, waking up to the Boston skyline was a nice treat! The W XYZ bar was our first stop after we freshened up and got ready for Friday night! We just missed the Live at Aloft Hotels concert that they have every Thursday night with acoustic performances of some of Boston's emerging singers & artists, but Gary was feeling a little musical and gave the guitar in the lobby a whirl! 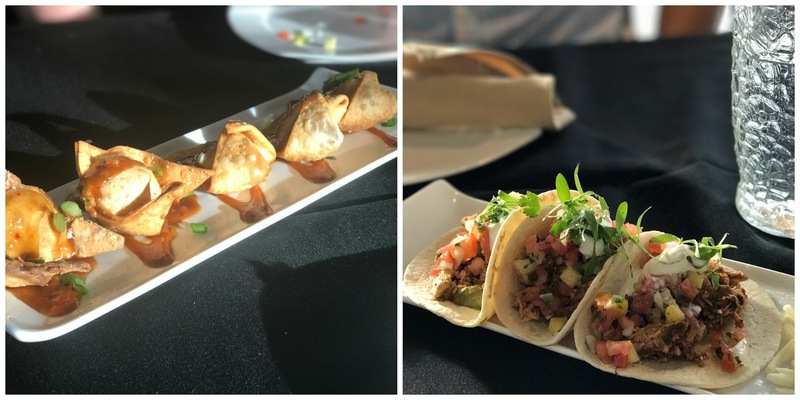 Although not affiliated with Aloft, the Social Register has an entrance inside the hotel & we were excited to finally eat at the sister restaurant to Brahmin in the Back Bay! The food is meant to be shared which I really appreciate because you get to taste test so much more that way. After a filling & delicious dinner we ventured 5 minutes up the road to Laugh Boston - a comedy club that we have been wanting to check out for a few years! The show that night was based off the game Cards Against Humanity & while parts of the show were really funny, some of the improv fell a little short, but we really want to head back when there's an actual comedian performing! We slept in late (8:00 AM 😂) and after grabbing a quick breakfast at the re:fuel station, we ventured to the splash pool! For lunch I wanted to cross off another restaurant & another lobster roll from our Boston list with lunch at Row34 in Fort Point which is about a 15 minute walk from Aloft. If you follow me on Instagram then you know we walked a ton - from the Rose Kennedy Greenway down to Chinatown & back up through Faneuil Hall - we had a blast exploring! Before meeting up with our friends we went to La Casa de Pedro - surprise, surprise - another new to us restaurant right down the road from the hotel. I don't think I have ever tasted such delicious chicken empanadas! We decided to split some of the tapas & tacos - best decision! What we enjoyed most about the location of Aloft was how close to the other side of the Boston Seaport it is! Our friends joined us for a proper night out in the city - filled with finding more frosé & visiting new roof deck bars! Thanks to the late checkout at the hotel (12:00 PM!) we were able to sleep in and still have time to play a few lawn games at Lawn on D.
Yes, wearing my maxi dress in the bed because we came back after breakfast and I snuggled back in! We had the best weekend exploring more of our city! It was so nice to enjoy the comforts of "home" but feel like we were on vacation! After our first staycation we might have to make this a yearly tradition! Huge thank you to Aloft Boston Seaport for hosting us for the weekend! Have you ever treated yourself to a staycation? Link up below to share your weekend with us! Looks like you guys had a great time! I have always wanted to do a staycation too. So glad you guys got to try out different restaurants and explore a different area. How cool is that touch screen elevator?! Happy Monday! Aloft looks Ahhhmazing!!! The food..yum!! And how cute are you in that black one shoulder!!!!! Adorable!! Bet you are a recharged and relaxed for the week ahead! What a fun staycation! I love that you were able to play tourist in your own town....and walk a ton while you were doing it! Way to get that workout in! haha! I love a good staycation!!! Sounds like you guys had the best time. I love how you were able to try out all new to you places! Wow what a perfect weekend! It's so fun to see your city with fresh eyes & aloft looks gorgeous! Yay for a fun & relaxing weekend! This looks amazing and so relaxing! You always find the best food! Your staycation looks like so much fun and y'all did so much! The food looks amazing and how cool is the hotel tech! What a great weekend! What a fun weekend! I've never seen an elevator with a touch screen, pretty neat! We've done a couple staycations in Chicago but need to do that again with the kids! What a fun weekend! I love exploring bits of my city that I normally wouldn't and feeling like a tourist here. It's a fun deviation from the norm. All of that food looks delicious! That hotel looks so fun! I love Boston. We had a staycation in July here in NH and it was so fun and relaxing. Not having the pressure of airports etc, was so nice. Looks like you guys had a great staycation! Aloft is a great-priced, trendy hotel brand that we like to stay at! This hotel sounds so cool and state of the art! I've never been to a place that had elevators without buttons, though I must I admit, I'd be pretty skeptical to take them, haha. Girl, I wish Eddie considered waking up at 8am sleeping in, haha. I'm the early bird and he can sleep well into noon! It sounds like you had a wonderful time exploring your city. 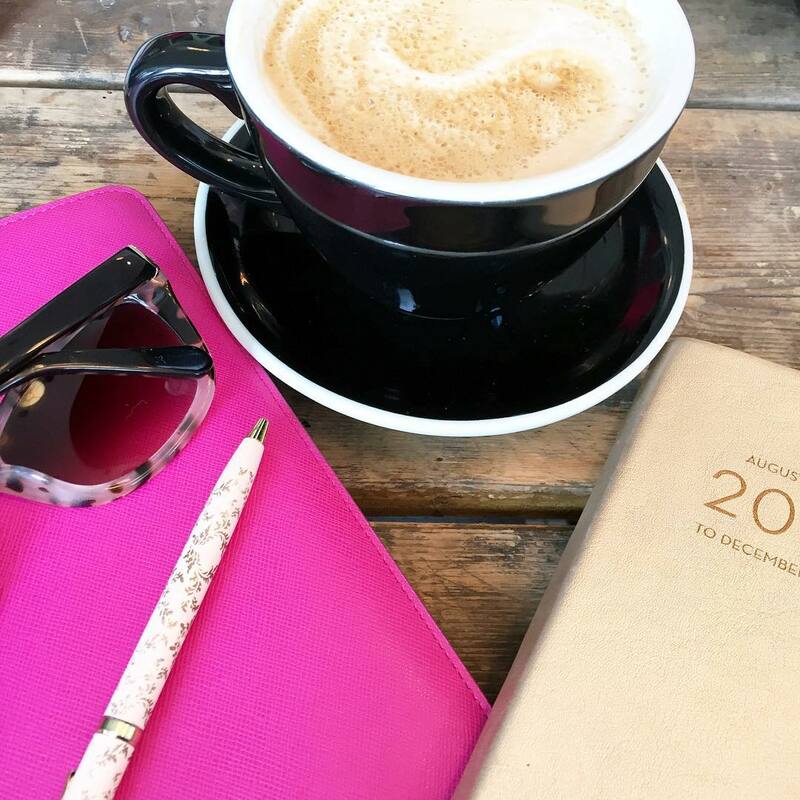 We've talked about doing this, too, since we haven't traveled abroad in a couple of years, you really get to discover some hidden gems in your own home grounds you wouldn't otherwise discover! Thanks for sharing, beauty, I'll have to keep this hotel in mind whenever I visit Boston! I hope you have a great start to your week! I'm so jealous ! Your staycation looks like such a fabulous time ! I'm hoping that after this year the hubs and I can venture somewhere nice and just stay at a peaceful hotel ! The food looks fantastic ! Love a good staycation! This place looks super nice. Cute pics! I loved looking at all your IG's over the weekend - this is so much fun! Staycations are the best and I love how you guys tried to do things that you haven't done before or wouldn't usually. This looks so fun! I've always wanted to do this down in Milwaukee for a weekend. You guys had great weather for all that walking! 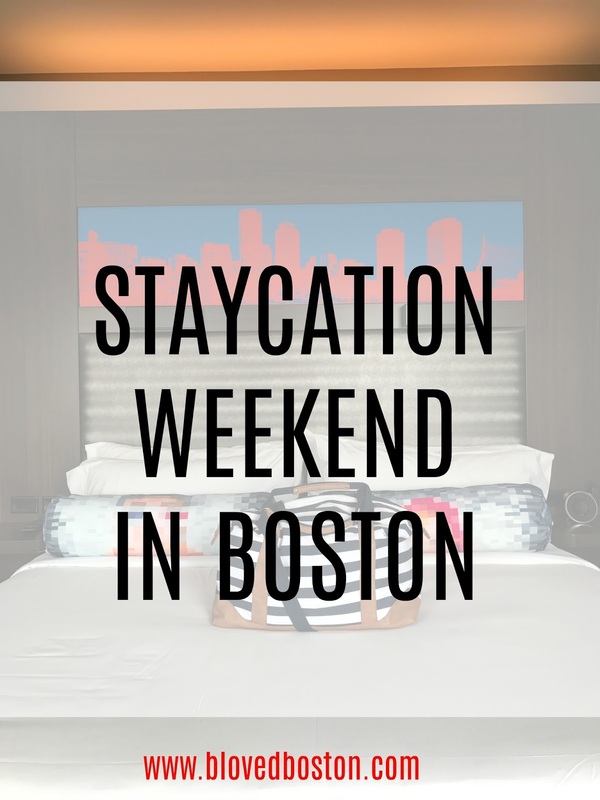 How fun is a staycation in Boston! I have never done one but now I'm going to put it on my list. Can't wait to be in beantown this week! I love staycations! I have heard great things about aloft hotels too. Looks like you had a great time. I love that they have lawn games. I have never been, but it's on my bucket list. It looks like you had a great time! I bet the food was really spectacular. Staycations are the total best! It is seriously such a great location. That whole seaport area is really booming and so many great places to eat! Love the rooftop views! You guys looked like you had a great time. I really enjoyed your instastories this weekend. This place looks fabulous! We have an Aloft hotel here and it always looks cool when we drive by. I love the idea of a staycation and getting to do some things in your own city that you usually dont. I always forget about the comedy club, but I have never had a bad time at one. Your food has me starving!!!!!! Aloft looks gorgeous! We keep saying we'll stay in Boston again next time we visit my parents for just a quick getaway (we always stay at the Fairmont but want a change)...maybe this is where we should go! That elevator keypad - crazy. I cant imagine that that thing doesnt need repaired a few times a month. Aloft hotels are awesome!! What a fun place to staycation and perfect time of year to be in the seaport area. All of that New England food looks so good, too! That place looks so cool! I can't get over the elevator buttons! Looks like you guys had a great time touring your own city! This all looks amazing!! What a fun weekend! What an amazing staycation! Everything looks so fun and totally my kind of outdoor stuff to do! Technology these days is nuts! Opening a door with your apple watch... so cray! Have an awesome week! One day I need to visit Boston and explore your city. Love the maxi and that last photo of you relaxing is awesome! What a great staycation! That hotel looks fantastic! What a great weekend!! We stayed at an Aloft in San Antonio a few years back and really enjoyed it. This looks like such a great stay. I am drooling over all of your food and how fun are those lawn games! What a beautiful hotel! It looks like you guys had a great weekend staycation! You have the best weekends, B. That food looks absolutely delicious. You almost want to ask why travel when a staycation could be this fabulous. What a fun weekend! I'd love to do a staycation here! Maybe I'll treat myself once volleyball is over. That elevator is awesome! Too fun- I love the idea of a staycation in your city; I want to do this for KC! What an awesome hotel...we stayed at the Aloft right outside of Boston when we came and it was so modern, full of cool things and friendly staff- we loved it. I love how you're exploring parts of the city you normally don't...so fun! Staycations are always so fun and yours looked amazing! Aloft looks so gorgeous and how yummy is all that food?! Staycations are great. You gave me some ideas. All dishes look really tasty. I've always thought the Aloft hotels looks so trendy! Looks like they really are on the inside. I'll have to stay at one in the future. I stayed in Aloft in Munich! I loved it!! They are great hotels. I'm thinking I should book this one for the conference next month! (One of my favorite people has already booked it.) Your staycation looked like SO fun... and I still love that picture of you at the bar - just gorgeous! Suchen Sie nach hier,jadegowns.de abendkleider westmünsterland reviews hier finden Sie die besten und billigen Kleider für sich selbst, herzlich willkommen! Boston has some great foodie spots. It looks like you had a nice staycation! Chris and I love Aloft hotels because they're just so much fun, plus I love that they're dog friendly! I've been really wanting to do a staycation lately just so we can get out and explore some things in a part of the city that we don't normally get to visit!